To tell you that I LOVE Peacocks is such an understatement!! I have always been drawn to their regal colors, large plumes and regal gate. So creating a fun Punch Art that ties to this majestic bird is a great way to tie into my Upcoming Punch Art Card Making Class (THIS Friday, March 7th from 6:30-9:30pm, go ahead RSVP ASAP!!). 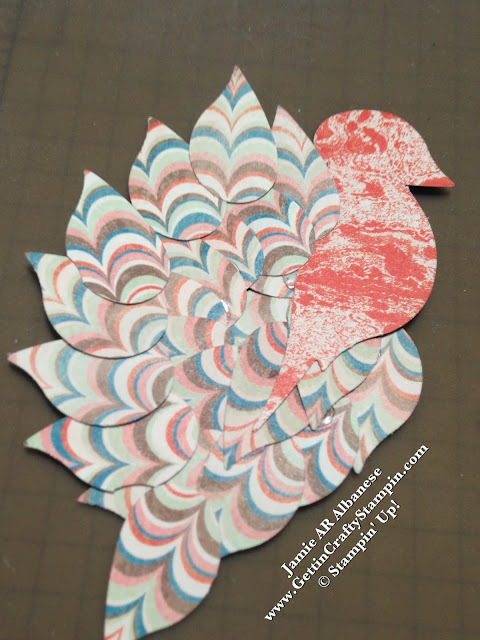 Join me in creating a Punch Art Peacock, hand-stamped card and Join My Classes! Did YOU KNOW?? Peacock feathers, if plucked, will lose their colors! A peacock feather has to be shed, naturally, from a male (female peacocks are not nearly as colorful - sigh). So, don't go plucking any peacocks (they are a loud bird, can be aggressive and 'mean' and are know for overriding neighborhoods, like that of our Uncle and Aunt). Still, a regal and beautiful bird, as long as you don't have them invading your neighborhood - lol. The amazing thing about Punch Art is what you can create! I love that our Designer Series Paper, like this stunning Venetian Romance, is DOUBLE SIDED!!!! So you can create one image and chose what side you like the best. Our Designer Series Paper collections are paired perfectly so that you can mix patterns (oh so trendy, right now) and still look coordinated!! Thisssss is the back of the Punch Art Peacock and pretty while funky. 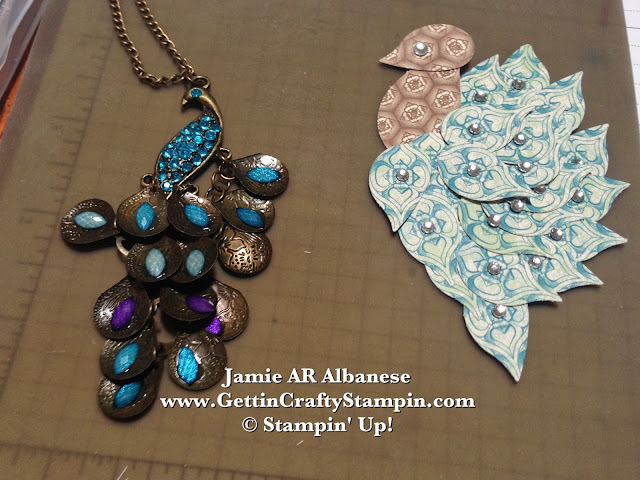 Inspired by my love of peacocks and this stunning necklace, this Punch Art Peacock came to life. 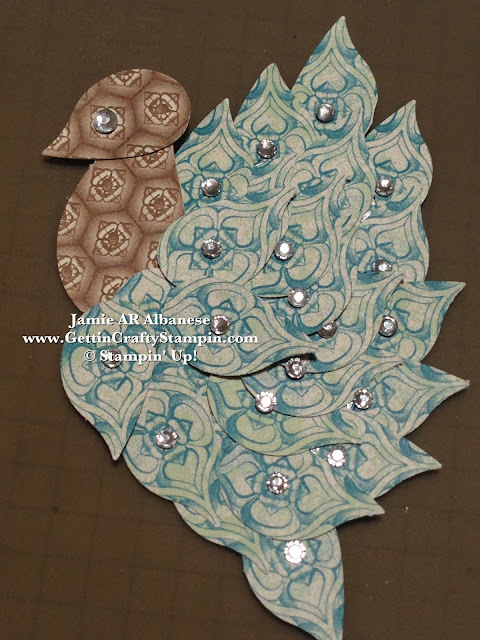 Add a dash of bling with the adhesive backed, stunning, Rhinestone Jewels in the center of the punched plumes. 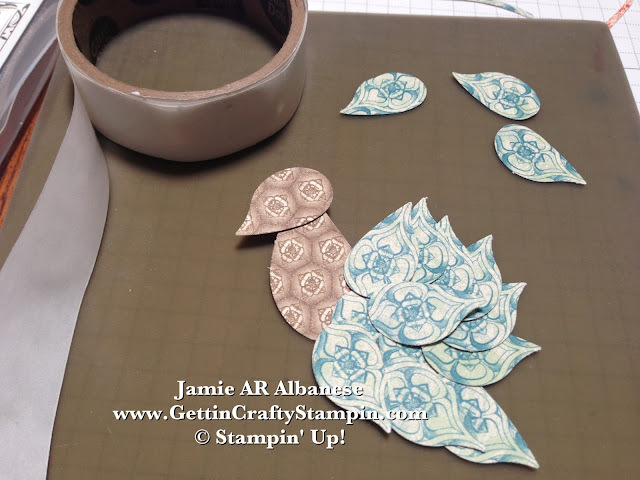 Create the beautiful bird with the aide of our super sticky Glue Dots. When you use adhesive that may stick to your graph paper/work station, use the Silicone Craft Sheet!! This sheet will prevent any accidental sticky situations. 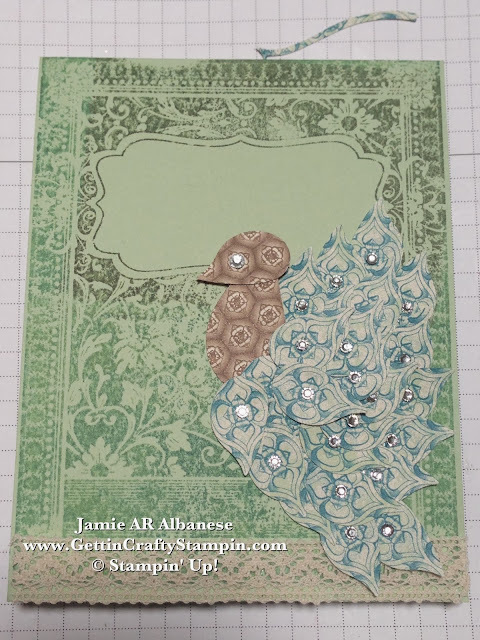 Regal, Vintage, Elegant.. Punch Art can be cute but you can create an elegant Peacock like this. JOIN ME to create STUNNING and Unusual, WOW cards with Punch Art! THIS Friday so RSVP ASAP!! Celebrate all that is vintage, elegant and stand out with these hand-stamped, punch-art cards! This hand-stamped, vintage, punch-art card embraces elegance and even a little of a stained glass look! Sending such an elegant bird and card is a sure fire way to WOW. 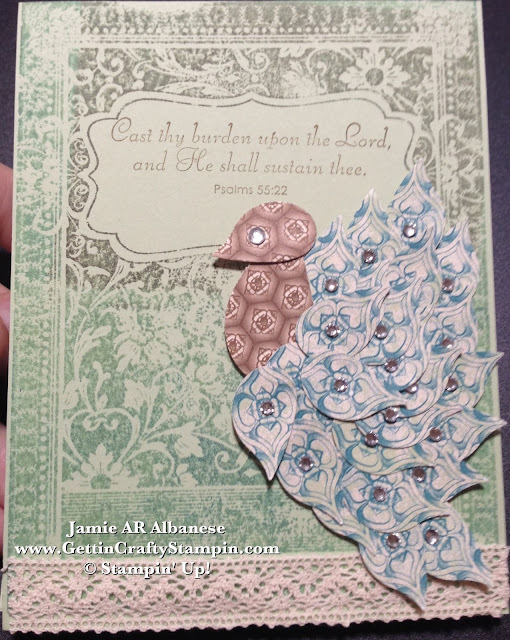 Celebrate the beauty of life and this bird, create a hand-stamped, punch-art card - with me! What do YOU think? Leave me a comment and let me know!